A spider in your fruit? Unlikely, and less likely to hurt you. So what’s the deal? Are spiders rising up against us by invading our fruit, vehicles, and homes? No. People are overreacting and the media is having a field day! We wanted to shed some light on what’s really happening and what you should do if you’re ever faced with a similar situation. The redfaced banana spider, Cupiennius chiapanensis, from Central America is a harmless spider often misidentified as a potentially deadly spider from the Amazon in South America. Photo by: Rick Vetter. Spiders hitchhiking in fruit — should we be concerned? Absolutely not; this is nothing new. Spiders and other arthropods have been accidentally hitching a ride in produce since it started being imported into the United States. Bunched fruits such as grapes and bananas make excellent hiding places for small insects and arachnids. Banana plantations, orchards, and vineyards attract plenty of insect visitors, both beneficial pollinators and detrimental pests. All of which make an easy meal for hungry spiders, so these are wonderful places for them to call home. This can be a great thing for us because the spiders help control the pests, which can greatly reduce the amount of pesticide used on our food. But, obviously, when these fruits are harvested, it can bring them into our supermarkets and even our homes. The good news is that in the unlikely event you find a spider hiding in your fruit basket, it’s probably not a harmful one, according to arachnologist, Rick Vetter, who has been studying and identifying spiders brought into the country this way since 2006. Most of the spiders that appear in banana shipments from Central and South America are either the pantropical huntsman spider (Heteropoda venatoria) or the red-faced banana spider (Cupiennius chiapanensis). Both are large spiders that can be misidentified as Brazilian wandering spiders, and both are harmless. There have been several reports this year, mostly from the United Kingdom, of “deadly Brazilian wandering spider” eggs being found in banana shipments. The articles detailing these accounts have so many problems, it’s just mind boggling to me that they’re published and taken as any sort of reliable or accurate information. One article states that a woman purchased a bag of Tesco bananas and found an egg sac. After searching through Google, she saw an image that looked similar to hers, so she determined herself that they must be Brazilian wandering spider eggs. Hmmmm, interesting, wow, Google really can tell you EVERYTHING! Another article states that a family “fled their home” after finding an egg sac on bananas from Aldi and an “expert,” some guy who runs a wildlife sanctuary, told them that “on the balance of probabilities, it was probably eggs from a Brazilian Wandering Spider.” Wait… what? That sentence doesn’t even make sense, come on, people! The pantropical huntsman spider, Heteropoda venatoria, is a harmless spider found in many tropical locations around the world including Florida and Hawaii. Photo by: Rick Vetter. The main problem here is the lack of an actual expert to identify the suspected eggs. Many trained entomologists cannot even correctly identify the actual spider, let alone their egg sack. Anyone who is not an entomologist or arachnologist is definitely not going to get it right! 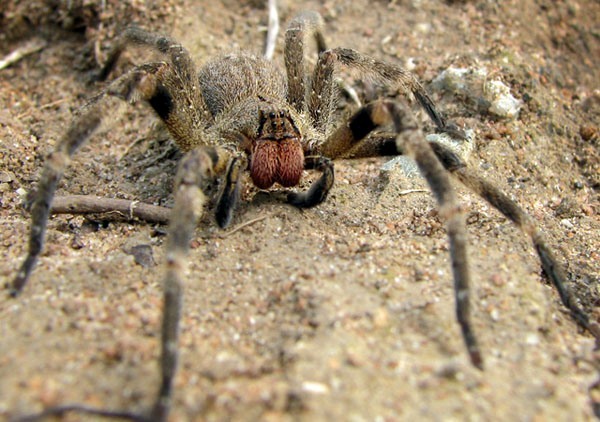 Another major problem is with the media automatically labeling something as a “deadly Brazilian wandering spider” or “the deadliest spider in the world,” which creates so much hysteria. 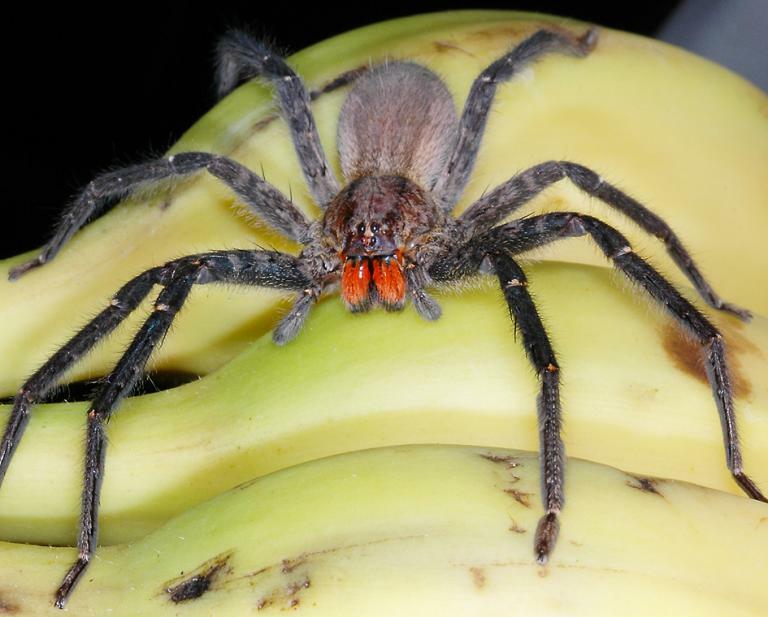 It makes people think that if they find a spider or eggs in bananas, it must be this kind, it will bite you, and you will die. But let’s look at the facts. Brazilian wandering spiders are actually a genus of spiders (Phonuetria) found all over Central and South America. Each species in this genus has a different geographical range, size, behavior, and venom toxicity. The species reported to have the most toxic venom, Phonuetria fera, is restricted to the Brazilian Amazon and two similar species, P. nigriventer and P. keyserlingi, are restricted to the Atlantic coast of Brazil. The two latter species are the ones usually involved in envenomations of humans in Brazil, as P. fera is usually far from banana plantations and not likely to come into contact with people or get into banana shipments. Furthermore, most banana shipments these days come from places like Ecuador and Costa Rica, not Brazil. This is not to say that other species in this genus found in Central America don’t occasionally get into shipments, because they can, and have. But these species are usually smaller and have less toxic venom. The toxicity of the venom is always exaggerated as well. 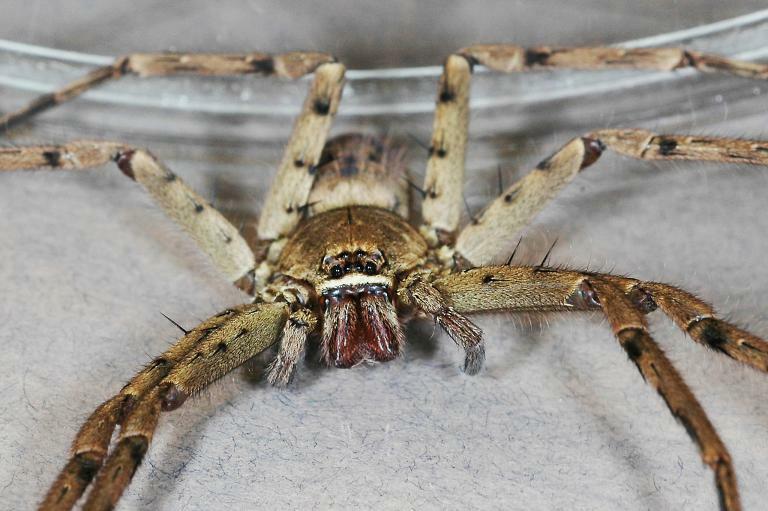 In a study of 422 bites from Phoneutria spiders in Brazil, only 2.3 percent of them had to seek treatment with antivenin, and only one death occurred. Most people had minor symptoms that resolved on their own. This is true when it comes to any spider considered “dangerous” like the black widow, brown recluse, or Brazilian wandering spider. Most spiders only bite in response to a threat they cannot escape from, such as being trapped. If you succeed in doing this to a spider, the bite is a defensive one, which may not even result in envenomation. Most types of spiders, especially from North and South America, are capable of saving their venom and delivering a “dry bite.” If venom does make it into your system, it is most likely a very small amount that will cause no reaction or a very minor reaction. People who are sensitive may experience unpleasant symptoms and may even need to be treated at a medical facility to control these symptoms, but death is highly unlikely. The groups of people most susceptible to venom are small children, the elderly, and those with compromised immune systems. Obviously those in any of these categories should be protected from spider bites, but knowledge and education are the best way, not overreaction and hysteria! So if you do happen to bring home fruit and find a spider lurking there, don’t do what these people did. Don’t flee your house or try to sue the supermarket. (It’s not really their fault!) Don’t call the media or 911. 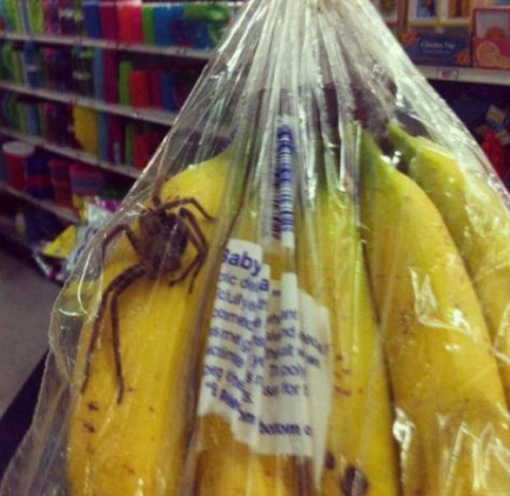 First, try to contain the spider or eggs by placing the bananas in a sealed plastic bag or box of some kind. It’s important to keep it intact for proper identification, a smushed spider is very hard to identify! If the spider drops to the counter or the ground, try throwing a cup or glass over it and slipping a piece of paper underneath to trap it inside. From there you can preserve it in the freezer, which will kill it, or the refrigerator which will slow it down until you can get it to someone for a proper identification. It’s not a bad idea to give the store at which you purchased the fruit a call, just to let them know you found a spider in their produce and you’re trying to get it identified. Finding a spider in a food product can be jarring, but don’t freak out. It’s most likely harmless. Report the spider to grocery store personnel or call an entomologist to be sure of the species. Next, find an actual expert to identify the spider. Stay away from pest control companies, they don’t always have an actual entomologist on staff, but they will be happy to give you a wrong answer and then tell you that your house needs to be sprayed for extra precaution. Call a university or museum and ask for an entomologist. If they don’t have one, they will know where to find one. Deliver the spider and wait for an answer. Most likely the results will come back as a harmless spider of some kind. In some rare cases, it may be a type of Brazilian wandering spider or perhaps a black widow. (This has happened.) As long as you kept a cool head and caught and isolated the spider without picking it up with your hands, you were not bitten by it! Call the store and tell them what type of spider it was. Then, move on with your life. And for goodness sake, if you see a spider on or near you, don’t jump from a moving car or try to set it on fire in the proximity of highly combustible chemicals. These other things will kill you, the spider will not! Next Post For the biggest haunting yet, visit HMNS Sugar Land!